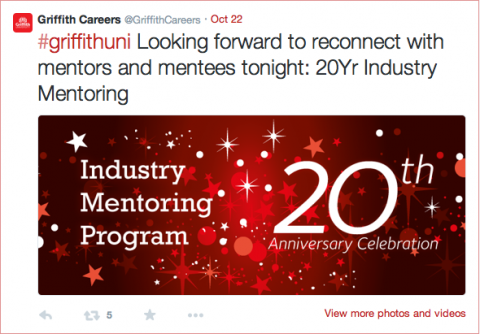 Griffith Industry Mentoring is a career development initiative that is aimed at supporting students to develop a deeper understanding of the professions they will be entering as graduates and establish relevant, nurturing professional networks. The Program has run as a face-to-face initiative for over 20 years, but significant increases in numbers of students seeking mentors, heightened interest in career outcomes overseas, and larger numbers of students undertaking their degrees in online or flexible mode both locally and internationally has provided the imperative for the Careers and Employment Service to consider methods to deliver the benefits of mentoring equally to all students. Griffith Industry Mentoring now operates as an online system that facilitates a wide variety of mentoring interactions, customised to student user priorities. 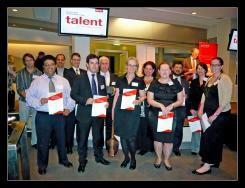 Griffith Industry Mentoring is a high-touch mentoring program that utilises an online platform to make the Program scalable, enabling more Griffith students to have the benefit of working with a mentor during their studies. This tool frees up Program Facilitator time for business development (mentor recruitment) and student support activities. Griffith Industry Mentoring offers three different mentor streams: Mentors based in Brisbane, Mentors based on the Gold Coast, and Mentors in all other locations. Students have similar streams, and register based on whether they are studying at one of our campuses or online. The Griffith Industry Mentoring Program is student-led, meaning the students, after completing the registration and training process (which includes reflection on their mentoring goals and tips on how to communicate with their mentor), navigate our system to search for and select their own mentor. As students make their selection based on their own career development priorities, matches are more relevant, and thus more meaningful to the students. From 2017, Griffith Industry Mentoring will expand to run two cohorts per year, one in Feb-June and the other from July-November. This added cohort makes participation in the Program more flexible for mentors and students and opens up more mentoring ‘spaces’ as student demand for mentoring currently outstrips the number of active mentors in our Program and continues to grow. For on-campus students, the format of our program may best be described by calling it ‘an online mentoring program punctuated by face-to-face interactions’. Students participating in the campus-based programs attend an in-person Orientation with their fellow students, a large networking function held by the University, meet with their mentor roughly fortnightly primarily at the mentor’s place of work, and may even complete work experience with their mentor’s organisation as part of the Program. But, they have the added benefit of the tools the online system offers, such as virtual collaboration, scheduling, messaging and interaction logs. Further, all of the information exchanged by mentor and mentee in the online system is preserved, so that the student may re-visit it at any time. For online students, students studying abroad or on exchange, or students interested in international career outcomes. The system offers the possibility of connecting with a mentor close to where they live, or working with someone in a region of interest. Students working with their mentor in online mode have access to all of the same collaboration tools as our local cohort, but primarily connect for their meetings via Skype. Students have a number of development tasks to undertake as part of the Program, including creating a business card, negotiating a mentoring agreement with their mentor, goal-setting and assessing the progress of the relationship and leading a discussion about this with their mentor. Students who complete all of these activities, and meet with their mentor as agreed in their mentoring contract can participate in the Program for a second time. Feedback from mentors and students who have participated in the Program has been outstanding. Mentors appreciate the opportunity to network with one another, help someone just starting out in their career and hone their coaching and leadership skills. Students appreciate the access to the world of work they will soon be entering, the chance to develop a network of relevant professional contacts and the opportunity to explore career outcomes arising from their study.